As a CEFEX-certified Investment Advisor, you can facilitate the certification of your clients, for a nominal registration fee. Your firm’s certification involves a rigorous assessment of your fiduciary processes and your investment portfolios. Your client can leverage your firm’s existing CEFEX assessment, thereby reducing the assessment requirements for it CEFEX Steward certification. This can be a very effective way to strengthen the bond between your firm and its most important steward clients, including plan sponsors, foundations and endowments. 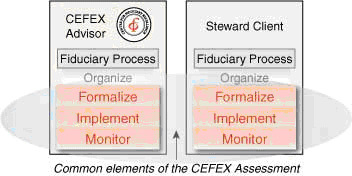 For more information on the CEFEX Investment Steward certification program, please visit www.cefex.org/steward.